PNP Director General Ronald dela Rosa’s recent claim that he has killed an alleged big drug lord recently in Valenzuela who’s surname is “Tan” would end up as hoax if President Rodrigo Duterte’s statement is true – that he has to invade a country to kill the big fish. Whatever the case may be, one of them is definitely telling a lie. It is just not clear at this point who among these two is the liar! The public might be too dumb to know why they only kill the small-time pushers and addicts but at least, they did not lie in telling the truth that such killings already escalated, even if Duterte’s administration continued to be insensitive in the massive pleas to stop the killings. “That’s the problem with Filipinos, many pretend to be bright when they are not,” the President said. Mr. Duterte said the Philippine Drugs Enforcement Agency (PDEA) placed at two million the number of drug users and pushers in the country two years ago. It continued: He said the present estimate has been pegged at 3.7 million. “You see the number of those who surrendered. You see it everyday on TV. And they say that crime has gone down, that’s natural. Why wouldn’t it go down when everything has been contaminated (by drugs),” he said. The President even described the selling of drugs here as “Chinese Style,” as peddlers have been selling drugs retail, making drugs more affordable. Mr. Duterte also said drug syndicates operating outside the country have been using technology, with a “big map of the Philippines to locate where to drop the drugs.” He said those being arrested in the country were just the “lieutenants.” “When we say big boss, general, they are not here,” Mr. Duterte said. The President was here to inspect the 4.5-megawatt biomass power plant that was scheduled to commercially operate by the end of the year. 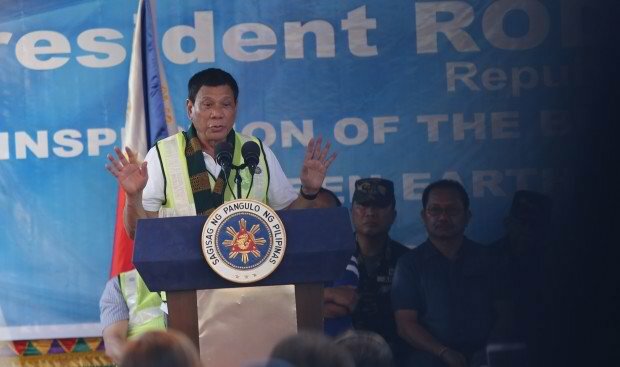 Friday’s visit here was the second made by the President to a province in the Autonomous Region in Muslim Mindanao (ARMM) since winning the elections. On Thursday, Mr. Duterte was in Basilan, where he held a command conference with military officials. The biomass power plant here is the first in the country. It will be using by-products from palm oil, and will be supplying power through the local power distributor. To produce power, the plant’s steam boiler will burn oil palm by-products like palm fruit fiber, nut shell, empty fruit bunches, the methane gas produced by palm oil mill effluent and low quality crude palm oil.